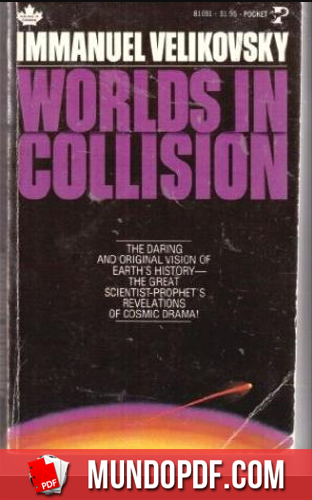 Worlds in Collision is a book of wars in the celestial sphere that took place in historical times. In these wars the planet earth participated too. This book describes two acts of a great drama: one that occurred thirty-four to thirty-five centuries ago, in the middle of the second millennium before the present era; the other in the eighth and the beginning of the seventh century before the present era, twenty-six centuries ago. Accordingly, this volume consists of two parts, preceded by a prologue. Harmony or stability in the celestial and terrestrial spheres is the point of departure of the present-day concept of the world as expressed in the celestial mechanics of Newton and the theory of evolution of Darwin. If these two men of science are sacrosanct, this book is a heresy. However, modern physics, of atoms and of the quantum theory, describes dramatic changes in the microcosm— the atom—the prototype of the solar system; a theory, then, that envisages not dissimilar events in the macrocosm—the solar system-brings the modern concepts of physics to the celestial sphere. This book is written for the instructed and uninstructed alike. No formula and no hieroglyphic will stand in the way of those who set out to read it. If, occasionally, historical evidence does not square with formulated laws, it should be remembered that a law is but a deduction from experience and experiment, and therefore laws must conform with historical facts, not facts with laws.